I was really excited to post my RAVE on the restaurant Al Dente. I even took pictures, even if they were amateur - I was proudly going to post them here. Unfortunately, I had some bad news given to me late yesterday afternoon. And so I have to postpone that post. My good friend Cubie - who's based in Hong Kong - has stage 4 cancer. I was and still am in shock. When my brother called to give me the news - I was in shock. As soon as I put down on the phone - I cried so hard and immediately called Cubie. And within a few seconds - she indeed confirmed that she was diagnosed with Lymphomatoid Granulomatosis - and it was already in Stage 4 and that it has spread to her chest, her lungs especially. The news broke my heart in so many pieces. I couldn't stop crying - I was inconsolable. I couldn't believe that she has cancer - she just celebrated her 27th birthday last February 21, 2007. She's so young!! What happened? With the few minutes we spent on the mobile - she was so calm in telling me what happend. We have been email-ing one another and she's been telling me that she has been feeling tired lately - we thought that it might be because of her being overworked. Then lately her face and neck were swollen - she went to 4 doctors and they just dismissed it as allergies. Then one morning - she couldn't open her eyes and she felt a lump in her neck - she was then admitted to the hospital. They did tests on her, she had an MRI, a CT Scan and a biospy - it was then confirmed that she has cancer. The cancer has spread to her lungs. She will undergo a full body scan today - to check where the cancer has spread. We're all praying and hoping for the best for her. I cried when I called my mom to tell her the news - I was crying so hard, I can't believe this was happening - I was in denial - I am still in shock. My Panget was also in shock. Cubie's such a good friend of mine - we've been friends since Kindergarten - and it's so nice that through the years - we're still close. She moved to Hong Kong last 1999 - and when she moved there - we became more close. I would ALWAYS visit her when I was in Hong KOng, we'd always meet up tp shop or eat out - we spent time together. We kept in touch via email and chat. And whenever she comes to Manila - we'd always go out to dinner and go shopping - it's a must that we see one another. My mom would even cook dinner for her and we always had her favorite Mango Cream Pie from Red Ribbon. I would send her packages like her favorite Combos and other items when I have friends or aunts who go to HK. There was even a time she stayed at my house for a couple of days during her stays. What I will NEVER EVER FORGET is that - she won a trip for me to Hong KOng via Cathay PAcific. Yes, she did - she won me a ticket last 2002. Who would have thought she'd win that ticket? The odds were enourmous! Imagine - the whole of Hong Kong - and she won me one! Sweet huh?! Yes, of course! I stayed with her in her family's pad in Sha Tin for a week. We were so relaxed! We stayed up late just exchanging stories. We had so much fun! Although we had moments of silence - we enjoyed each others company. When we felt tired from walking - we'd go into a Pizza Hut and order soup. I think we did that more than 5 times! I really can't believe this is happening. I am still in disbelief. Please pray for her. It will surely help. Last night, we gave Wytee away. The reason being, we had too many dogs here in the house. Sigh.. I'll definitely miss him.. I am currently loving this song by Incubus. 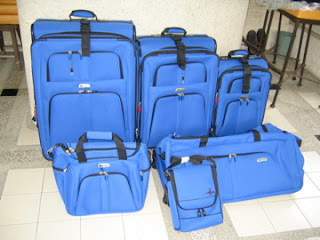 I am selling ORIGINAL Delsey Helium Lite Collection Luggages. I will send you more pictures and the pricelist. I heart Fridays! I always look forward to Fridays! For some strange reason - one them is because of 89.8's Friday Magic Madness (thanks to my Panget's 'era'). I love listening to OPMs especially those sung by Gary Valenciano - pre Born Again era, I think I've written about this a few posts ago. I can't help but smile and be giddy when I hear his songs over the radio. Like what my friend Jen said 'Panalo siguro, if we watched a Gary V. Concert' - Yes, I think panalong- panalo nga. The title of the song I was listening to was 'Wag mo na sanag Isipin' and here's the lyrics. It's so funny!! and True!! hahaha..
OT - If you want to reminisce on the not so Old Manila and check out this blog Nostalgia Manila - you'll see the TV shows you used to enjoy, toys you used to gaga over and old images of places you used to go to pre-Makati High Rise!! If you have time - check it out, I swear it's nakakatuwa and addicting!! :) Galing!